With warm weather finally here, it’s time to fire up the barbecue. Cooking seafood on the grill comes with a huge range of advantages, with great flavor at the top of the list. The intense heat of the fire and grill grate helps to enhance the texture of the fish and bring out a rich, fire-roasted flavor. You’ll also end up eating less fat, as all of the excess drips off the grates. Barbecue season is the perfect time of year for family gatherings, so grab a frisbee, a few lawn chairs and get grilling. Here are five of our favorite grilled fish recipes. We love Tilapia as it stands up well to the grill, but you can use any firm, flaky fish. We highly doubt there’s a simpler way to grill a Tilapia fillet than this recipe, which consists of just 4 ingredients and can be whipped together in a flash. The herb butter not only flavors the fillet to perfection, but it also adds a juicy texture. And, since Tilapia is extremely low-fat, you don’t have to think twice about that small indulgence. Try the recipe: Grilled Herb Tilapia from McCormick. This colorful dish calls for some slicing and dicing but the result is worth the elbow grease! Mango is bursting with vitamins, minerals and antioxidants that are linked to amazing health benefits. Mango has become known for its ability to lower or maintain blood sugar and boost brain health, and the bright fruit is also packed with vitamin A, DNA-repairing folate, calcium and a host of potent antioxidants. Oh, and it’s incredibly tasty too! If you want to get creative, you can mix up the recipe with whatever summer fruits are coming into season—substitute in some fresh peaches or nectarines, or continue the tropical theme by adding in a little pineapple. 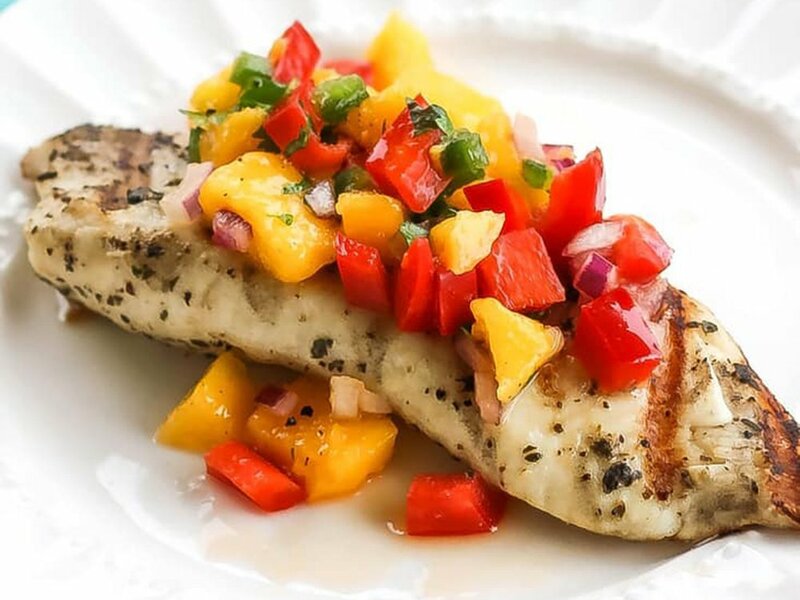 Try the recipe: Grilled Tilapia with Mango Salsa from The Girl Who Ate Everything. Cooking up this zesty Tilapia with garlic aioli will leave you feeling like a true chef. Decadent garlic aioli perfectly complements the crispy fish fillet, with the cajun seasoning adding the right amount of spice. This dish is sure to impress any backyard guest! Try the recipe: Zesty Grilled Tilapia with Garlic Aioli from Genius Kitchen. This flavorful Tilapia recipe relies heavily on spices and herbs, which are antioxidant, immune system-boosting components. The dynamic marinade calls for spices like paprika, lemon pepper and garlic powder to be mixed with healthy fats and herbs, including basil and olive oil. All of these ingredients work together to subtly yet effectively bring out the natural flavor of your fillet. The dish is a crowd-pleaser and can be paired with a number of versatile side dishes to coordinate any meal theme you desire. 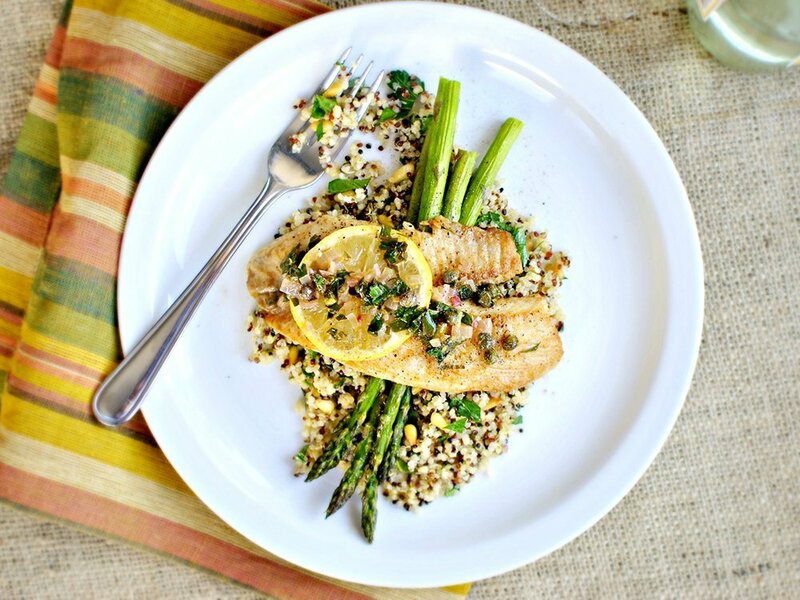 Try the recipe: Garlicky Grilled Tilapia with Couscous from Real Simple. If you want to shake things up at your first backyard barbecue of the season, be sure to give this Tilapia bowl with chipotle avocado crema a go. Corn, tomato and avocado give this bowl a range of flavors and textures. The recipe also incorporates protein-packed gems like black beans and quinoa, and the Tilapia itself offers 21 grams of protein per 4-ounce serving. This dish is easy to adapt for picky eaters, so simply set up an ingredient bar for guests to customize based on their taste. Try the recipe: Grilled Tilapia Bowl with Chipotle Avocado Crema from Love Grows Wild. Start planning a tasty, pescetarian-friendly barbecue with friends and family today! And don’t worry if you’re new to grilling: everything you need to know about how to prepare fish in any style can be found in our handy guide. For a list of side dishes to serve with your grilled Tilapia, check out these delicious grilled side dishes from The Healthy Fish.